Beautiful, spacious, four cabin global cruiser. Fresh and airy, with plenty of light and storage. Extensively refit in 2017-18, with mechanical rebuilds, new canvas, new electronics, fresh brightwork, new cushions in cockpit and below decks. Now ready to go anywhere in style and comfort. West Florida Yachts would love to guide you through a personal showing of this 68' Formosa 68 New Horizon Caribbean 1982. 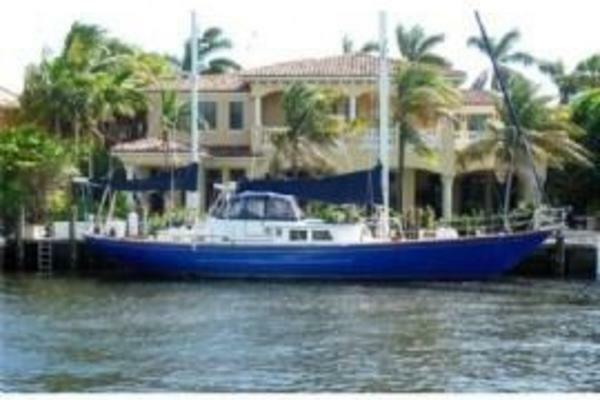 This yacht for sale is located in Cruising Panama Panama and priced at $179,000. For a showing please contact us by filling out the form on this page and we will get back to you shortly! Big center cockpit with table big enough for dining alfresco with all your friends. New cockpit cushions and plenty of room for lounging with your friends and family. Easily seats 10 or more under the fairly new bimini. The full width master stateroom is aft with access to the aft deck through a companionway. This stateroom features a queen bed, plus a single berth, large hanging closet (3'8" x 3'8" and over 6' high), two additional hanging lockers, eight drawers plus a vanity. There is a private head with new electric toilet, tub/shower and Air-Con. Forward of the master stateroom to starboard is the companionway with double door access to the engine room. The companionway leads forward to the navigation area located outboard to starboard. Forward of the master to port is the galley with fridge, cooker, oven, microwave, sink and counter area. Many cabinets over and under make storage of food and cooking utensils easy and handy. Forward of the nav station to starboard and galley to port is the massive salon. It features a large table to port and a settee to starboard. Forward of the main salon are two separate guest cabins, one port and one starboard, with hanging lockers, storage drawers plus two cabinets above the berths, plus mirrors, Air-Con and En-Suite heads with new electric toilets. Berths in these forward guest cabins are each configured as bunks, with the lower being larger than the single upper berth. The guest cabins share one large shower. A forward companionway leads to a fore-cabin that is used for storage or crew quarters with a V-berth. Forward of the crew quarters is a chain locker. The boat is finished in beautiful warm teak throughout. The boat has been extensively refit over the last year, with many, many upgrades and improvements. Contact broker for a complete list and for a link to the substantial photo library for the boat.